The seed of ASR was The Insects That Are Not Aliens Surfing Club, a loose group of log riders from the Australian deserts also frequenting Noosa Heads who were obsessed by The Hot Generation, Evolution, Miki Dora, Keven Brennan and 1966-67 garage psych-punk music at a time before became they became emblematic of log riding. The rise of the Insects and log riding culture can be scene in the three eras of blogs on this site. ASR arose to interpret and nurture the shift toward broad ideas about surfing, particularly log riding. Further, we support creative, inclusive places despite the structural and commercial dimensions of oppression which otherwise restrain freedom of expression and truth in Australian cities. ASR is bound up with the spirit of the individual, quasi-religious themes, beat literature, the nature gods...and fun. To achieve its vision ASR became the production team behind a number of printed articles (see particularly SLIDE and Foam Symmetry magazine) pop-up events (including The World Log Riding Exhibition 2013, 2014, 2015), a zine The Side-Street Tymes, plus home-studio-done screen-printed tees. In 2012 ASR took pictures and wrote an article called Duffel Coat Disciples about the abiding ghost of just-surfing on the east coast of Australia. It was published in SLIDE magazine issue 24 Ryan A. Smith Ed. Please obtain a copy of that magazine if you can! The original words of that article are supplied here for the benefit of broad mynded exponents who surf how they want to, or for those who could be. On the edge of Armageddon, when the systematic blindness which has hidden the broader purpose and form of surfing post 1966 seemed so close to insurmountable: Something wild-ecstatic and eternal has been revealed at the last possible minute. REJOICE! In Australia (and universally), disruptive surfing which has been secreted in less-known sanctuaries (the other side) continues to function alongside the conventional, authorized rules of surfing engagement and is, indeed, beginning to overthrow the silence enforced by a loopy pork chop regime campaigned in darkness to limit the vastness of the surfing experience into sellable entities, nasty merchandise, and pop-out equipment. A resurrection is taking place. At the same time, it appears increasingly unlikely that there was a golden era of surfing prior to commercialization, nor a present age composed solely of banal corporate conformity; rather, glorious surfing for its own sake has always been there, practiced in hidden localities at strange times, and talked about only in dirty cafes and side-streets. And the shift toward free-mind-surfing is strengthening. Individuals of the resurrection have begun to surf for pleasure alone! Mad-hysteric-child-souls showing the surging triumph of the surfing spirit – electric cul de sac mind bursting longings mingling with the roused-up memories of mad-gleeful ghosts of undead surfers trapped in the joyous mystery of organic trees and stones and swamps and pointbreaks and houses – bearing the message of a reawakening in favour of raw, expressive surfing for the sake of joy. What does this surfing look like? Whatever it wants! In increasing numbers, switched-on waveriders are saying goodbye to yesterday’s sorrows to be a part of the great society of defective, unclean degenerate surfers hidden somewhere in imperceptible breaks and deserts and swamps and coves and sunny points and semi-industrial enclaves and shacks and cars and decrepit food joints on mournful hills in holiday towns and sordid pool halls and art deco dives in the city; demonstrating an ongoing divergence away from the dominant, singular truth of surfing lied-about by an increasingly forlorn commercial regime (shops, competitions, bug-eyed zombies). To explain further, take the trip now with a loose cast of duffel coat disciples in an ironic maroon Volvo bound for an inner space journey along the smaller, forgotten routes from Sydney to Noosa Heads, Australia – mystical Chiko Roll children including Cuts Doloro (taking over the body of Alex Bullpitt), Matty Chojnacki (the greaser), Andy Findlay, and other harbour city heroi’s, Lachlan Leckie steering, Megan Wagner, Kym and Tim Crabtree, Parrish Watts, Peter Farrelly, also coming across the kindly Cuddihy, the Messiah Mark Matisons, Kent Turkich gesticulating wildly writing unsane things and surfing unhinged, and other unrepressed exponents of the resurrection. The jazz enthusiast photographer Dean Darby doing circles on a Persian rug, repeating the model numbers of 1,000 different cameras and endless scenarios and heavy plans, mad ramblin’ and dusty suede boots well into the night, next level hobo savant – present to capture the light of the tryp in strange ways and days. Unable to find a kiosk rendezvous on the next street without a map, he maintains genius dexterity to coerce a stately collection of 1950’s photographic equipment into channelling the mood of this dazzling ceremony (and other psychic occurrences). A swell is making its way up the coast. In the night on the highway in the moon bus passing by jazzed ghost surfies haunted in the forests and cosy cabins around the swampy towns with milk bars providing particularly attractive meeting points for these joyful-restless apparitions still lingering during the day. Hear thousands of voices in the distant dark, waiting for the sun to rise into the fifth dimension; on and on in endless circles. A flying saucer hovers in the background. Matty Chojnacki in Sydney! The harbour city! Northern beaches – hot generation – valiant rocker – post corporate bebopper – polite outsider creeping ’round the cross in creepers for eternities. Quietly around Collaroy cinema – art deco still alive – Collaroy surf club still standing – Manly surf club still untouched. It’s haunted in there. On the beach, minimalist incredible explosions of future-past-surfing. On the beach in the surf club, the Easybeats play wild vibrating music to a wild mob of mods doing the mod nod in desert boots – She’s So Fine. Little Stevie is insect-like and maniacal. Taman Shud. Pond play next. The Otchkies five years ahead their tyme (reverby). Lachlan Leckie mystical-gleeful-ecstatic surfing inside the sausage roll formations of Chojnacki’s psycho-billy hair. He never left the paradise of childhood, and as an artist avoided being kidnapped by corporations. He looks at the surf. Fragmented. Other times coherent with amazing lines. Dora D-fin cutting it at Broken Head, Greenmount, and in front of the watchful surf club at Currumbin. A junior accounts clerk haircut he borrowed from 1947. In love with a girl, Megan Wagner, who surfs easeful-delicate in Doris Day jumper and vixen allure embodying the cult of sisters surfing better than anybody else – the beautiful pixie Sara Page playing and dancing like an angel with a Raquel Welch silhouette bewitching the awe-struck antique ocean in perpetual springtime – the dainty powerful Paige Maddison perpetual poise and elegant cross-stepping across gleeful pointbreaks into the setting sun for always. Amazing mind flowers taking 99 steps to the sun. The most sophisticated surfers do almost nothing. Alex Bullpitt as Cuts Doloro wakes at dawn wearing Greenough hoody, dreaming of a past life as a dandy, a king, the King of Moffats Beach Caloundra, and joins the misty riders in tomorrow’s program – straight back – unseen in the curl – a primitive form of surfing – a lamington and lime spider smile unlocking the door to life’s mystery. By defocussing you can make out the form of Russell Hughes bicycle stance through the lineup (he’s done it again). Or Keven Brennan living unredeemed switch-stance in his perfect wave forever! At Tea Tree, a seabird is transformed into the form of Parrish Watts – totally committed to seclusion but with time to smile to the hangers-on and rubberneckers from under the embryonic tunnels of low tide in heaven – uncommitted to any company nor fleeting trend – unseen 1930’s toothpick, bellyboard and body surfing waterman representing the untamed spirit of surfing from the edge of town and time. A brown roll for lunch. Too-sweet-coffee from a sad plastic bottle. Saintly as we have egg and salad sandwiches on the other sidewalk, I saw ourselves walk into the coffee shop years later and younger than now in the same old duffel coats and too-tight jeans and banana bread stained thrift store jumpers and found-sunnies and jazzy smiles. The lord of fuzz Peter Farrelly can see for miles and miles – the gonest garage beat enthusiast – born in a Neanderthal cave – spooked woods. A sea of joy tracker handed to him by the spectre of Ted Spencer in a dream in the shadows of knight. Psych-out! Caveman mod – post dogger (doing away with dogma) – inside cylinder steeler recalling Midget in the mad never ending sun. The Messiah Mark Mattisons – sandstone university boffin with a marked out career. His true being rises: Unutterable mysteries which cannot be brushed aside are revealed by the infinite waves and fires in the Noosa hinterland and unconscious world. His surfboard is super flat; or uncanny vee bottom Venus space ships shaped in a granny flat in a guilty leafy suburb in a boomtown – eternal telephone surfboards. Surfers yielding to the exquisite passions of what they really might be! They are all mad children of the mushroom – expressionists of embryonic involvement riding a variety of joyful shapes with strange familiar style swept up in a blissful psych rock vinyl soundtrack like Evan Daley tripper – revelling in back alley production – clear glass – impossibly small decals – very thin fins crazily teasing the sunshine – fantastic plastic machine explosions of time – tee shirts made in the bathroom – tie dyes – shiny black rubber suits flowering paisley – stupidly short shorts – defiant headcocks – mad posture moving like crazy – crazy grins – glorious laughter – mind blown – involved – cheap sunnies – pink zinc – surf burger salvation – fringing fruit and vegetable stalls on the side of the road – bananas – raw and alive, living lean for the chance of realising the whole vivid dream – there’s freedom out there in the talking trees – talking dragons – talking flutes – talking to Thomas Bexon on the plastic telephone – talking about a resurrection – past and present joined up – irrelevant – revelation – liberation – referencing Bobby Brown (still around) (perennial). These are still the days. Something not touched by the cycle of decades and aeons, novelty nor business. In non-time, we are far from finished with the “golden ages” of surfing as our modern counterparts pretend. Something forever is coming into being. Rest easy children, for the spirit of surfing is ancient and eternal and speaks softly to all. 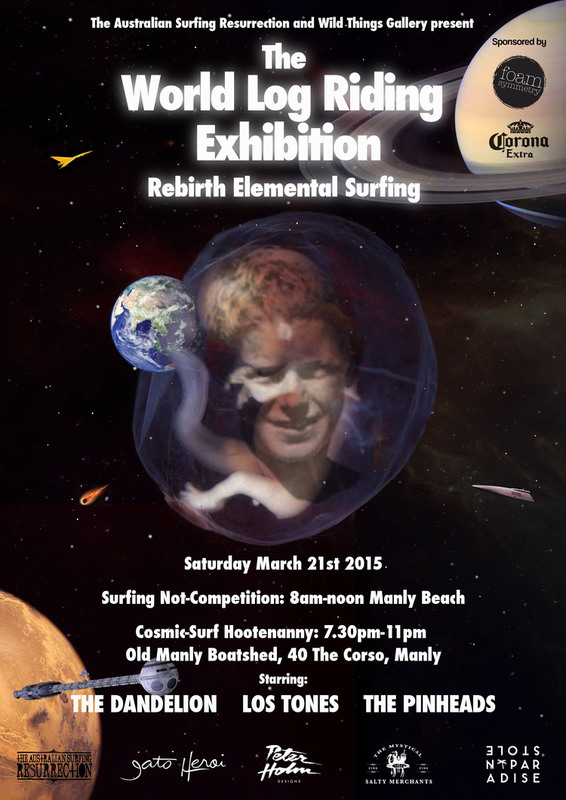 One of the main events conducted by ASR in collaboration with Wild Things Gallery, Gato Heroi, The Mystical Salty Merchants, Wailin' Robbie Warden and Foam Symmetry Magazine, The World Log Riding Exhibition was a raw surfing carnival of beat surfies, artists and small 'brands' which took place at Manly Beach, Sydney, in March - one week after the Noosa Festival of Surfing for the convenience of international surfies. The not-competition took place when conditions were good and payed homage to the competition which Ted Spencer wins in the movie The Fantastic Plastic Machine, as well as the 1964 Word Surfing Titles, with a cicadelic rock'n'roll and greaser hop at knight. 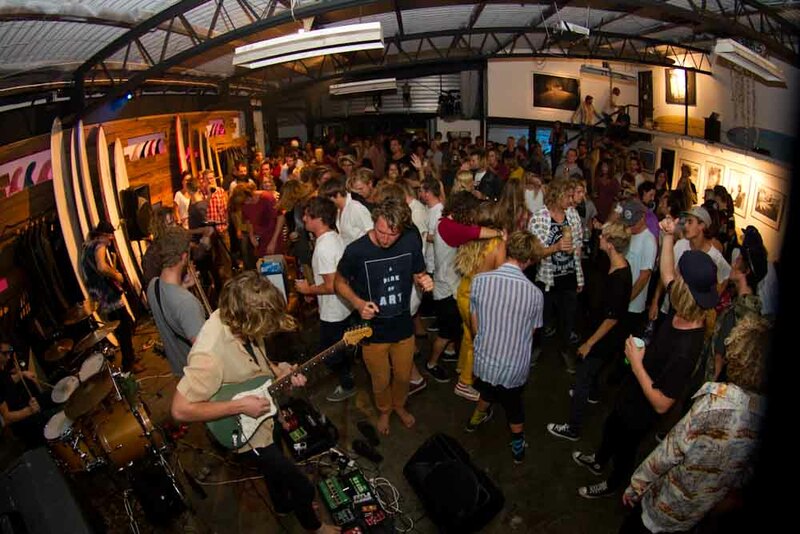 The 2013 inaugural event was attended by some of the world's maddest log riders with an out-of-control party at the gallery (as documented in the Foam Symmetry article 'On the Mean Psychedelic Streets of Sydney' ) reclaiming the weird yellowish sands of Manly as a site for untamed surfboard riding! 2014 was especially floral culminating in the Babe Rainbow wild knight and the cut-up article 'Feel Cauliflower Taste Rainbow' in Foam Symmetry! In the 2015 the Manly Boat shed shook to the aciid county sounds of Los Tones and The Dandelion, and produced a darker document in Foam Symmetry perhaps signifying that ASR began to deliberate the future of the event and fear of it becoming too...legible. The Mayan Vee Bottom Ceremony succeeding in eluding that staleness and commodification while putting a focus on mid-length boards.